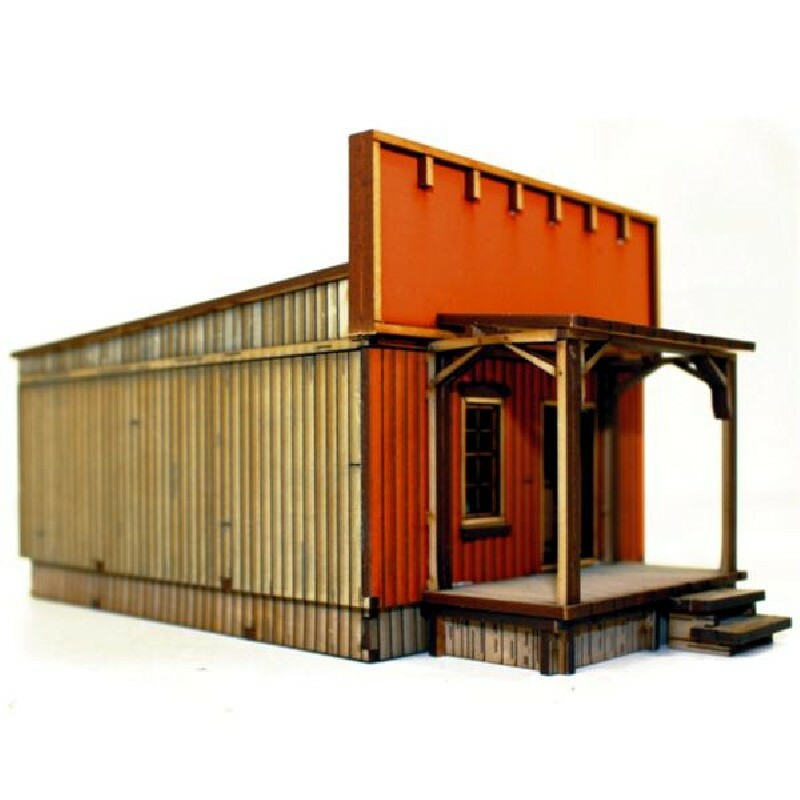 Dead Man’s Hand buildings are a growing range ideal for games set in Old West Cowboy towns and Mining CampTowns of the late C19th and early C20th. This building is from the side streets of town and not as tall or as brightly painted as a main street building, The external doors, even the roof hatch, are all hinged and can open and close at any time (note the optional boarded window at the back if you don’t like the view). Not only is the outside highly detailed, with an open veranda, the inside walls are well detailed and white washed. The roof and porch both come away to help with movement of figures during in-game action. This building sits securely on a raised sub-floor and also included with the kit are raised boardwalks that go beside the sub-floor giving many options of alignment. These timber framed buildings often with massive head boards became common place in the midwest during the 1870’s, due mostly to the advent of industrial saw mill manufacture revolutionising lumber milling in North America. Cheap mass produced standard lengths of timber could be delivered by wagon or train almost anywhere even in areas where adobe was the traditional building type. Many of the areas where these buildings sprang up were liable to heavy rain and flash flooding, sub-flooring and external boardwalks created and odd ‘Venetian’esk” landscape but these canals were roads now turned to muddy quagmires. The main street or ‘main drag’ was often bedecked from end to end with boardwalks. If a local ‘big shot’ owned more than a few of the main street buildings, such as saloons, hotels or even ‘ditty bag’ shops and ‘dry goods’ stores, he was said to have a ‘boardwalk empire’!